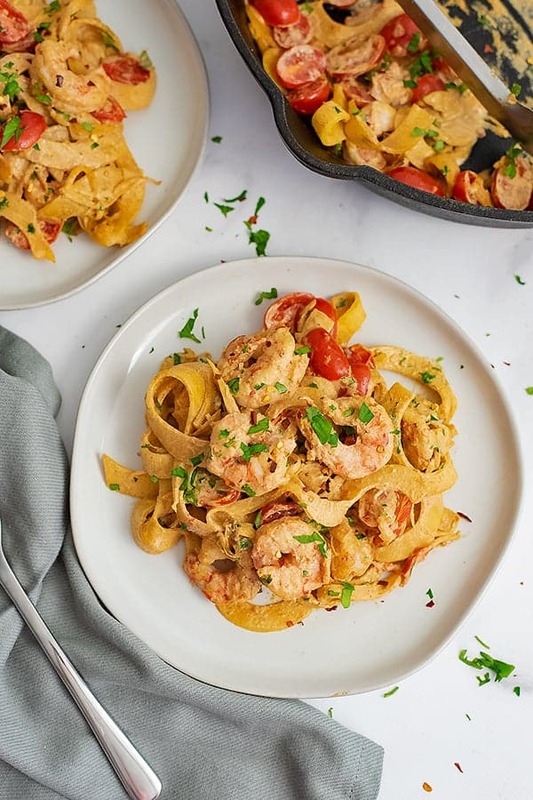 This Whole30 creamy Cajun shrimp pasta recipe is the perfect weeknight meal! 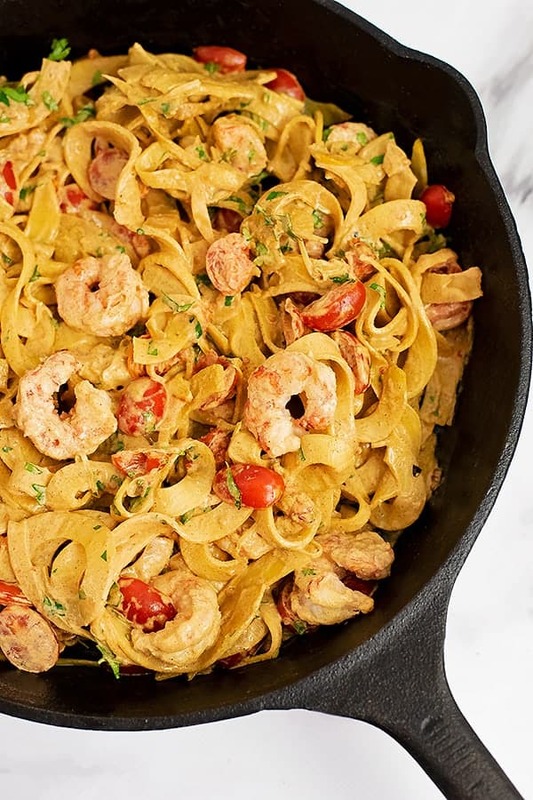 This Cajun shrimp pasta only needs one skillet and about 15 minutes from start to finish! Made with rutabaga noodles, this recipe is paleo, Whole30, lower in carbs and simply delicious! Growing up we didn’t eat any seafood except for fish sticks (from a box of course). I don’t think that fish or seafood was very popular back then though. Well I’m so glad that has changed, because shrimp is one of those super simple protein sources that cooks up in just minutes and can make any dish go from ordinary to extra special! At least that is how I feel about it! 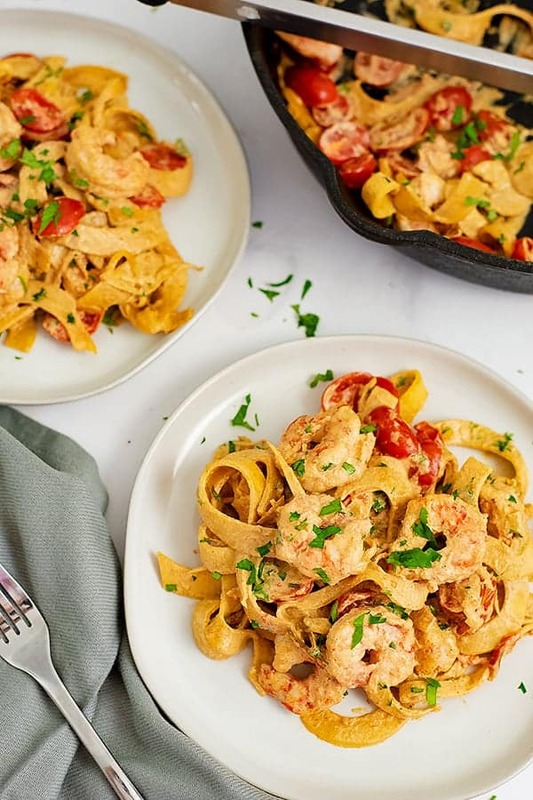 This Whole30 creamy Cajun shrimp pasta recipe is a combination of a few of my favorite flavors! 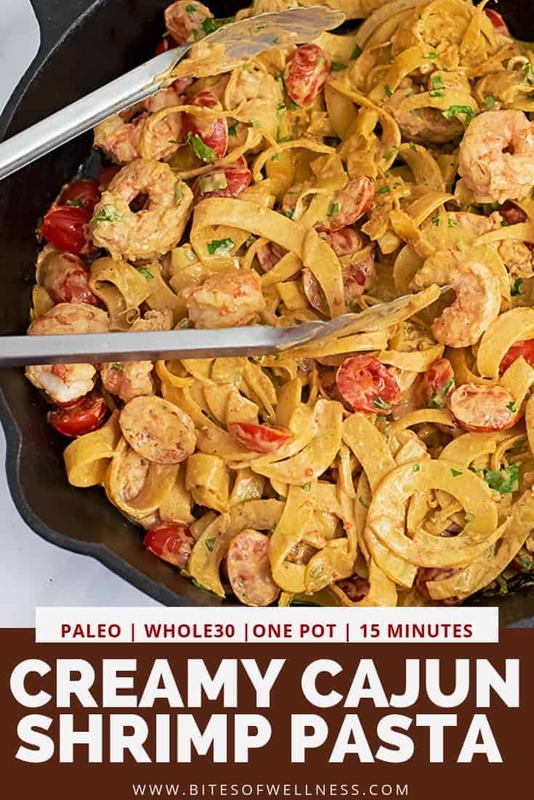 A creamy Cajun sauce with a kick of spice, tender shrimp and rutabaga noodles (the perfect Whole30 pasta alternative)! The fact that it can all be made from start to finish in 15 minutes is putting it up there on my favorite weeknight dinner meals for sure! I like to buy a 1 pound bag of frozen shrimp from Trader Joe’s when I go to have a quick and easy protein for dinner. Did you know that most fresh shrimp sold at the store was shipped to the store frozen and then thawed out to be sold at the fish counter? So you are really better off buying it frozen and defrosting it yourself. Plus that can often save you money! Buy shrimp that have already been peeled and deveined! Let me tell you from experience, there is nothing worse than having to peel and devein your shrimp when dinner needs to be made quickly! Spend the extra dollar or two, it’s money worth spending (if you have it). Buy big enough shrimp! Those little tiny shrimp are often cheaper but once they cook up they are so tiny! I like to get the 21-25 count for dishes like this where the shrimp are a big part of the meal. 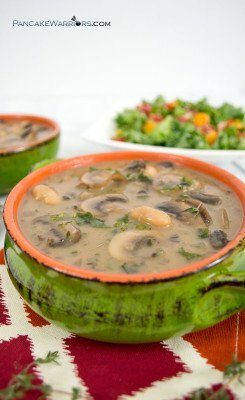 Smaller shrimp are good for soups and stews! The easiest way to defrost frozen shrimp is to allow it to defrost slowly (overnight) in the fridge. Be sure to put a bowl or plate under the shrimp so no juices leak in your fridge. Place the shrimp in a colander and dunk it in a large bowl of cold water. Let the shrimp sit in the cold water for about 10 minutes. Change the water 2-3 times until the shrimp are defrosted. 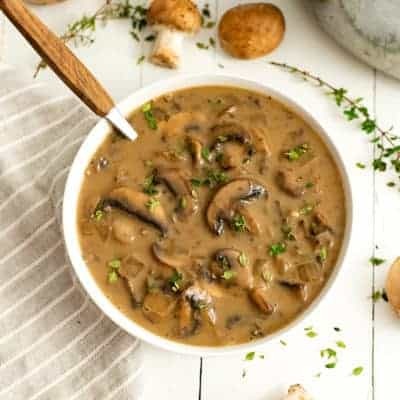 To make this creamy Cajun sauce you only need a few ingredients and a high speed blender (I use a Ninja bullet (affiliate)). I like this creamy Cajun sauce to have just a small kick from red pepper flakes but if you like it really spicy, you can add up to ½ tsp of cayenne pepper. Rutabaga noodles are my go to for pasta when I’m trying to get in more veggies! Unlike zucchini noodles, they hold up really well to sauce and keep a really al dente texture, even when sitting in sauce for hours/days. Rutabaga noodles only take about 6-7 minutes to cook, making them a better option than spaghetti squash if you are in a rush! I always keep 2-3 large rutabagas in the fridge for the nights I’m craving pasta! They hold up well in the fridge for 2-3 weeks, so buy a few and keep them on hand! 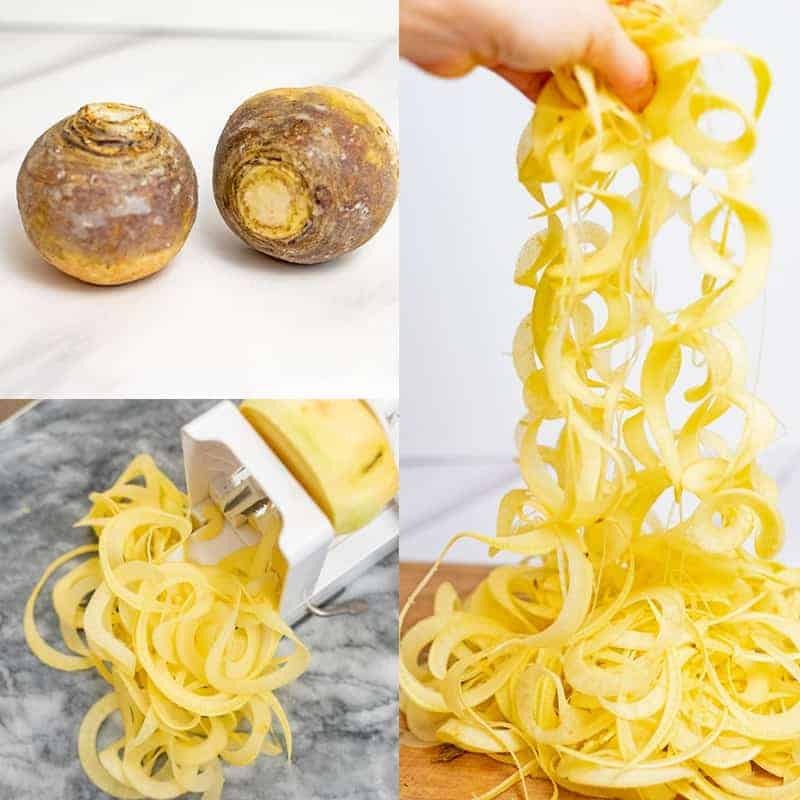 To get a tutorial on how to make rutabaga noodles, check out this simple rutabaga pasta recipe! To make this a well rounded quick and simple meal, you can serve this creamy Cajun Shrimp pasta with quickly steamed broccoli or sautéed kale or spinach! Another great option would be to serve this with a fresh side salad made with balsamic tahini dressing! If you don’t have a spiralizer you can use roasted spaghetti squash (check out my tips on how to make roasted spaghetti squash fast) or you can buy butternut squash noodles or sweet potato noodles as well to keep this Whole30. You can also use gluten free pasta if you aren’t doing a Whole30! You will have to cook the pasta according to the directions on the box! I really like using a chickpea or lentil based pasta or brown rice pasta for gluten free options! I really like Modern Table (affiliate), or the Trader Joe’s brown rice pasta or red lentil pasta! You can also make this with meal prep shredded chicken, canned salmon or shredded jackfruit, or seared crispy tofu (not Whole30 but good vegetarian alternative). You can also use soaked cashews (raw cashew are best). If you have time, simply cover your cashews in fresh water and let them soak on the counter for 6-8 hours (up to overnight). 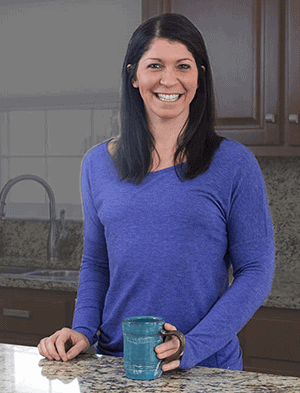 Before using, drain the water and rinse the cashews once or twice. If you are short on time, pour boiling hot water over the cashews (or cover the cashews in water and microwave for 2 minutes) and let the cashews sit for 5 minutes to soften. Raw cashews are best for this. Before using, drain the water and rinse the cashews once or twice. 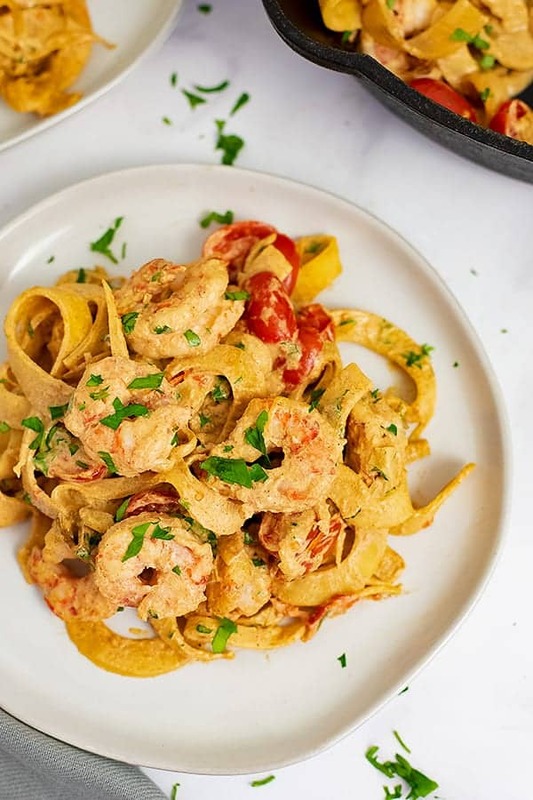 Whole30 Creamy Cajun Shrimp Pasta recipe is the perfect weeknight meal! Ready in 15 minutes, this simple dish is packed full of flavor and is so easy to make! Whole30, paleo, lower in carbs and is the perfect healthy comfort food! Add 1 tbsp avocado oil and the defrosted shrimp. Cook 2 minutes. Flip the shrimp and cook 2 more minutes. Remove from pan. Lower the heat to medium. Add 1 tbsp avocado oil to the pan and the spiralized rutabaga noodles. Cover the pan and cook 5 minutes. After the rutabaga is done cooking for 5 minutes, remove the lid and add the chopped tomatoes and salt. Stir well and cook 2-3 minutes. 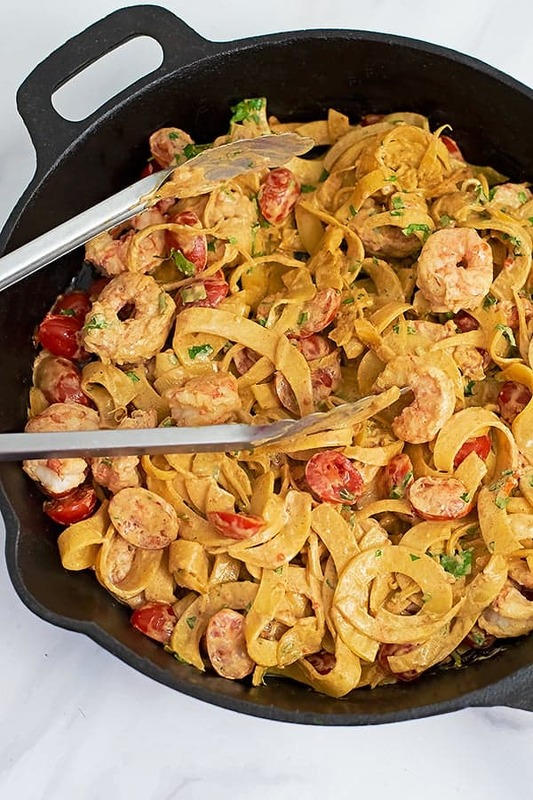 After the rutabaga noodles and tomatoes have cooked 2-3 minutes, add the creamy Cajun sauce and the shrimp and stir well to combine everything. Put all the ingredients for the creamy Cajun sauce in a high speed blender or bullet blender and blend on high 1 minute until creamy.